The MAXx Backboard System Package #2 includes the MAXx backboard, one of the most X-ray translucent backboards available. The MAXx backboard is made in the USA, is lightweight and has no metal pins. 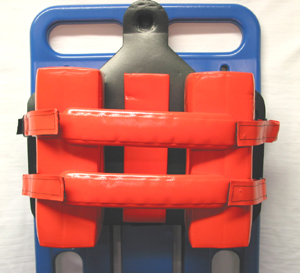 This backboard system includes 1 MAXx Backboard, 1 Pop-on Head Immobilizer and 4 Velcro body straps. One of the most X-ray translucent backboards available. Tail drop for easier placement and extraction from car seats. Lime Green color for easy identification. Dimensions: 72 x 16 x 2 1/4", weight of board 15lbs. Click here to view product spec sheet.